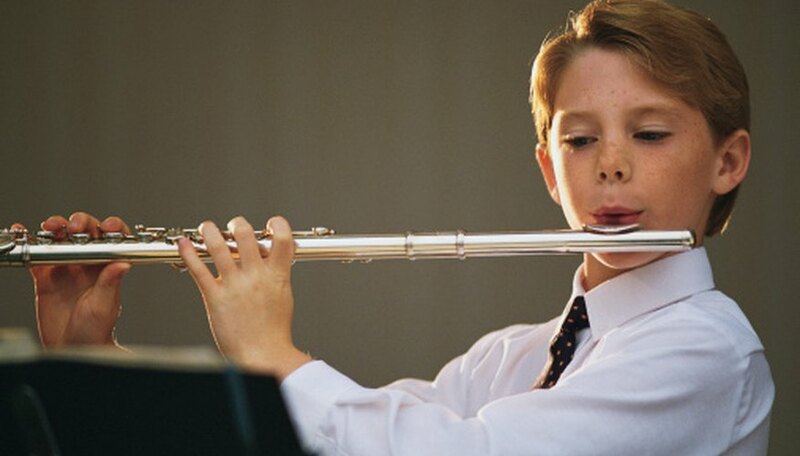 To play the flute, you first learn to make sounds, place your fingers, and get in the correct posture. Next you must learn good breathing techniques and fingerings to many notes. All this takes practice. The trick to getting good is to use practice time wisely and not fall into the trap of "practicing your mistakes" -- that is, not really learning a piece but instead getting good at playing it wrong. Remember that when you master an instrument, you're actually mastering yourself. Practice making a sound, using only the mouthpiece or "head joint." Insert the mouthpiece into the body so that the middle of its hole is in line with the middle of the body's second key. Insert the foot joint, turning it so that the raised rod where the keys are attached is in line with the middle of the last key of the flute's body. Read the lesson from the method book and then practice it, checking the key signature for the key. (The lesson might list the key, for instance, C major, with no flats or sharps in the key signature.) Practice finger coordination, closing and releasing keys simultaneously. Practice the scale of the lesson's key. If the book teaches you the major scale with its matching minor scale, practice both. Set a moderately slow beat on your metronome -- say, 76 or "andante" -- and practice the scale for breath control, taking a big breath at the beginning and trying to use it for the whole scale. Hold each note for two to four beats, rationing breath while blowing evenly. Use your diaphragm muscle (found between the bottom of the rib cage and the top of the abdomen) to support the breath, gradually squeezing the muscle in and up as you push out every bit of air. Look over a piece from the studies book, choosing one with the same key signature and difficulty level as the lesson in the method book. Notice notations such as "forte" (loud) or "piano" (soft), along with tempo, using the metronome to help you achieve the speed you're shooting for. Practice getting the fingerings right, and obey the notations. Even though the studies book might seem like just a collection of musical pieces, each of those pieces is chosen to reinforce method book lessons. Isolate and practice trouble spots, slowing way down so you can listen and feel yourself deliberately place your fingers. Start at a few notes before the trouble spot and finish a few notes after. When you can do this stretch of notes with ease, speed up a bit and practice again, increasing your pace until you're up to tempo. Practice the solo piece, paying extra attention to the dynamics -- that is, the instructions that tell you, for instance, to play soft or loud, fast or slow, or with joy or sorrow. These dynamics turn a piece from a collection of notes into music. Check your books for a picture of someone making a sound on the instrument or go online to find a demonstration. If your shoulders are rising into a shrug when you take a breath, you're not doing it right. Place your hand between your chest and belly button to feel your abdomen expand and contract with breath. Don't be discouraged by the scales practice. At first your diaphragm muscle will not be up to the task, and you won't be able to complete the scale without another breath. Persistent practice will increase your capacity. If you haven't learned all the fingerings to a scale, focus your practice on the section you know. For band, you will have to sit to play. Sit forward toward the edge of your seat, keeping your torso erect and arms held properly. As a beginner, you might become dizzy. Take a break, and then practice while sitting on a bed.